AMHERST, Mass. - No. 4 University of Massachusetts hockey used three power-play goals to build a 3-0 advantage and skated to a 4-2 win over New Hampshire on Sunday afternoon at the Mullins Center. The victory moves the Minutemen to 10-1-0 overall, 6-0-0 in Hockey East, the best start in program history. UNH sits at 1-6-3, 1-3-2 in league play following the setback. "That's another solid win for our group," said UMass head coach Greg Carvel. "I thought first period we were solid; we came out in the second period and could have stretched the lead to three or four, then there was a 10-minute stretch in the second period where UNH turned the game on us. Outside of that, I thought we were very good. UNH, they can hurt you. They're a good offensive team; I was very concerned about them on the power play and in transition tonight, I thought we gave them a little too much, but Matt Murray played a solid game as usual and the power play was very good, as usual." UMass converted its first opportunity of the contest with the man advantage at 6:56 of the first period to take a 1-0 lead. 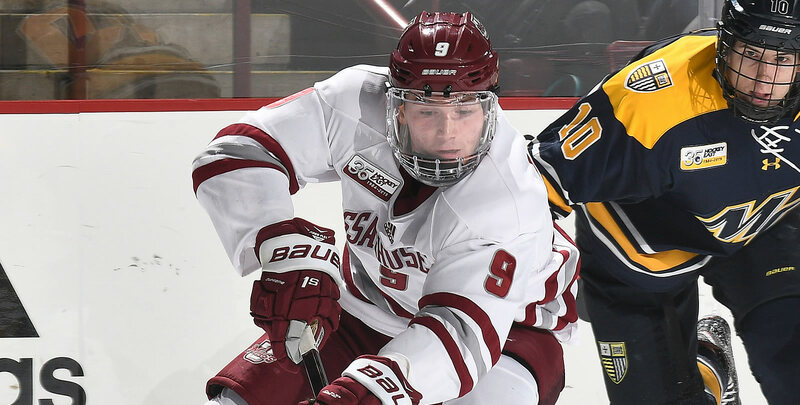 Senior Jacob Pritchard redirected in a Cale Makar shot from the point for his fifth of the season. Freshman Marc Del Gaizo earned an assist on the play as well, his fourth of the year. Just five seconds into another power play chance for the Minutemen, sophomore John Leonard pushed the score to 2-0. Pritchard's turnaround shot attempt off the faceoff was saved by Wildcats netminder Mike Robinson, but Leonard was there in the slot to bang home the rebound at the 14:42 mark of the opening frame. Midway through the second, sophomore Mitchell Chaffee cleaned up a loose puck in front of the UNH net from Pritchard and Leonard for yet another power-play goal, 8:02 into the period. Moments later, at the 9:45 mark, Ara Nazarian scored on a breakaway to put the Wildcats on the board. Charlie Kelleher then cut the UMass lead to one with a power-play goal from Max Gildon at 14:22. Anthony DelGaizo gave the Minutemen back their two-goal cushion before the end of the period, though. Sophomore Mario Ferraro sent an outlet pass to Leonard, which started an odd-man rush for UMass. After Leonard's initial shot was stopped, Del Gaizo was there to clean up the rebound at 16:49. The Minutemen out-shot UNH, 34-20 in the contest and went 3-for-4 on the power play, while the Wildcats were 1-for-5 with the man advantage. It marked the fifth time this season (11 games) that UMass has scored two or more power-play goals. Sophomore Matt Murray maintained his perfect record on the year (7-0-0), making 18 saves en route to the victory. Robinson had 30 stops for UNH. Both Leonard and Pritchard finished with three points apiece on a goal and two assists, Leonard's fifth multi-point game this season and Pritchard's fourth. The Minutemen continue their three-game homestand next Saturday, Nov. 24, when the squad will play host to No. 15/13 Princeton at 7 p.m. in the Mullins Center.